On June 21, 2018, The Supreme Court ruled in favor of South Dakota, granting the state authority to impose sales tax obligations on out-of-state transactions without requiring physical presence in the state. Since the ruling, several states have responded by implementing legislation to adopt economic nexus provisions thereby requiring remote sellers to collect sales tax without having a physical presence in the state. 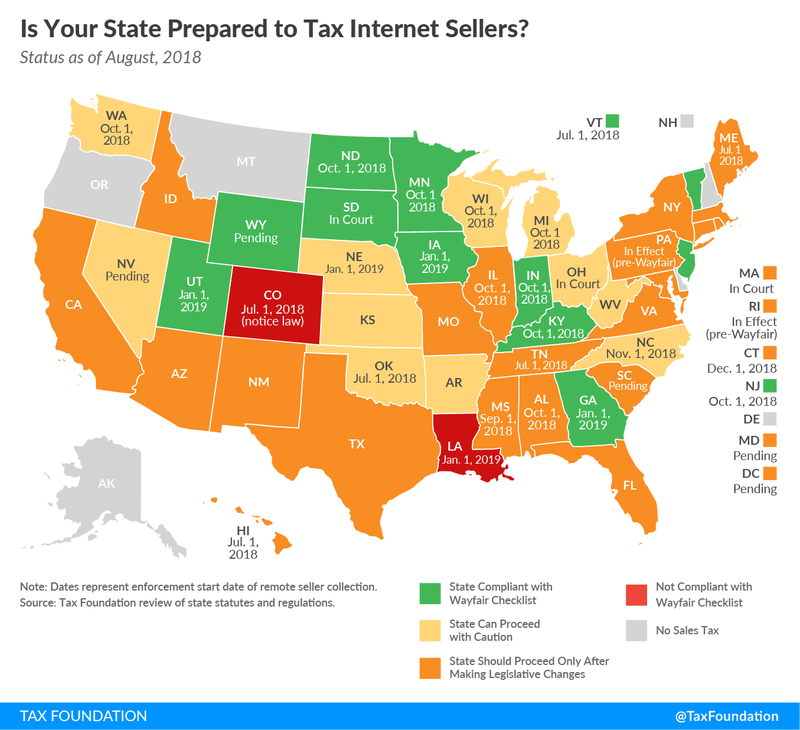 To help you navigate the ever-changing nexus landscape for sales tax, please use the Sales Tax Economic Nexus for Remote Sellers chart below to help you identify which states have adopted economic nexus provisions. We also have an Economic Nexus Evaluator Tool to make an initial analysis of your economic nexus footprint. Please fill out this form to have it emailed to you. Will the Supreme Court’s decision impact companies of all sizes? *Colorado and Louisiana are allowing for a grace period to begin reporting and collecting. Sales tax collection in those states is currently voluntary until such grace period ends. In Colorado, the grace period ends May 31, 2019. Louisiana has yet to determine the end of the grace period. Virginia Yes $100,000 in gross retail sales 200 separate retail transactions One Previous or current calendar year 7/1/2019 – Economic nexus and marketplace facilitator provision HB 1722 Remote sales & use tax collection; sufficient activity by dealers & marketplace facilitators, etc. *Does not include any proposed legislation or information regarding notice requirements for marketplace facilitators. **Makes 10 or more retail sales totaling more than $100,000 or 100 or more retail sales and systematic solicitation of sales in the state. Remote sellers are not required to collect sales tax in Minnesota when a Marketplace Provider is collecting and remitting. ***Under Ohio law, an out-of-state vendor that uses Ohio software to make sales or that has relationships with content distribution networks in Ohio and has gross receipts of at least $500,000 from sales of tangible personal property to Ohio customers is deemed to have nexus. **** Beginning July 1, 2017, businesses with more than $267,000 of yearly gross receipts sourced to Washington in 2017 ($285,000 in 2018) or at least 25 percent of total yearly gross receipts sourced to Washington has nexus for retailing Business and Occupation (B&O) tax. *****Beginning January 1, 2018, remote sellers and marketplace facilitators making $10,000 or more in retail sales to Washington purchasers must either 1) register their business, and collect and submit sales/use tax on sales to Washington purchasers; or 2) follow the use tax notice and reporting requirements. Once a business exceeds the $100,000 in retail sales, or 200 transactions as of October 1, 2018, the business no longer has a choice and must register and collect retail sales/use tax. Stay up to date with Peterson Sullivan's thoughts, insights, and news. Peterson Sullivan is a Seattle-based CPA and advisory firm known for the expertise we bring to publicly traded and closely held middle-market companies, nonprofit organizations, and high-net-worth individuals throughout the Pacific Northwest and around the world. © 2019 Peterson Sullivan LLP. All Rights Reserved. PS Wealth Advisors, LLC is a registered investment adviser in the state of Washington. The adviser may not transact business in states where it is not appropriately registered or exempt from registration. Individualized responses to persons that involve either the effecting of transactions in securities or the rendering of personalized investment advice for compensation will not be made without registration or exemption.